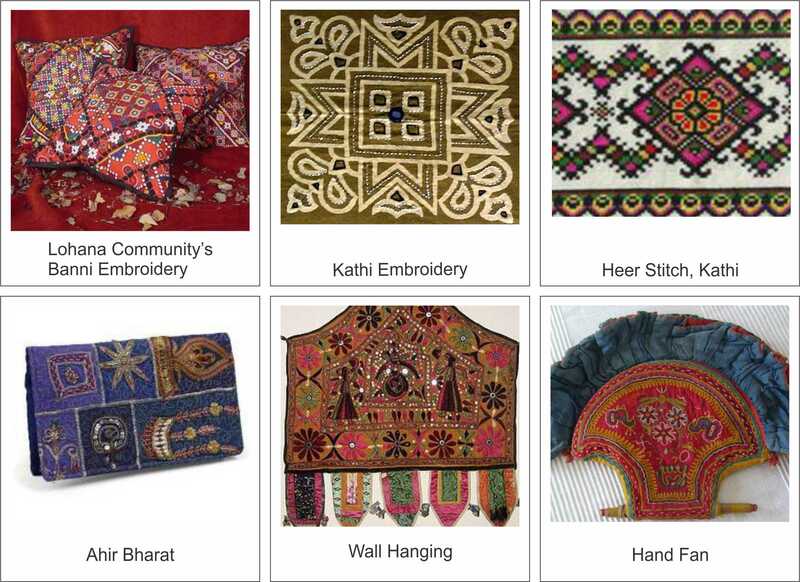 GUJARAT IS HOME TO SOME OF THE MOST EXOTIC EMBROIDERIES. LET US SAVE THEM, KNOW THEM AND ADORE THEM BEFORE IT’S TOO LATE. Gujarat is better called Manchester of the East. It has been involved in textiles since centuries. Almost all parts of the state have a unique style of textiles, weaving and embroideries. All the creations have a versatility that makes the embroideries famous all over the world. 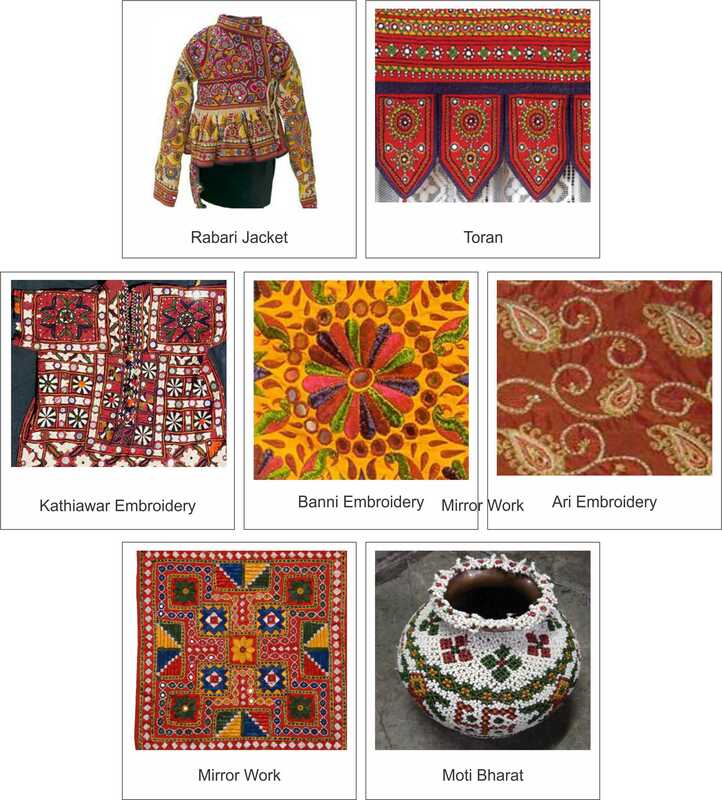 The most important centers of embroidery work of Gujarat are located in the Saurashtra and Kutch regions and are admired for their creative excellence. Kutch, being a desert, there are less chances to celebrate life. But the way people live is really varied and appreciable. The women add colors to life and create innumerable opportunities to celebrate everyday life through their arts. A striking feature of the Kutch embroidery is that at a very early age, the girls acquire the embroidery skills and they prepare their own wedding garments. These exclusively created embroidered works are then sent to the in-laws for closer examination, which is one of the important criteria for deciding matrimonial alliances! Saurashtra, on the other hand, is home to the oldest form of embroidery, Kathi, which is known for its romantic motifs. The designs and the techniques vary with the communities and regions. Apart from this, the embroidering is a source of second income for most of the nomads, wives of the herdsmen and agriculturalists of Gujarat. The artisans of Gujarat use an array of stitches that are used to decorate the items. The embroidery of Gujarat is highly praised for the distinct quality of raw material and the creations follow an excellent technique. The embroidery work done by the people of Gujarat thus displays the artisanship of the local artisans. These deserve promotion and acceptance. 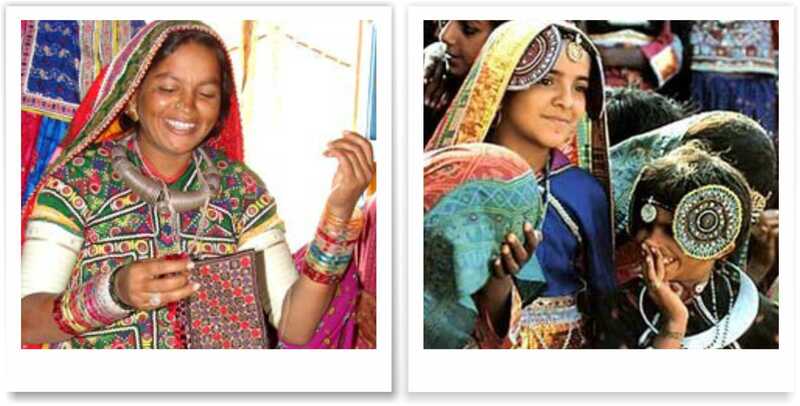 Whenever we visit Kutch or Saurashtra, let’s make it a point to bring home these colors of life! Walking in white salty Rann of Kutch in the full moon night, visit to India-Pakistan International Border, newly declared protected wetland Chhari Dhand, India’s western most point Lakhpat fort, Handicraft villages, ethnic culture, Kutchi music, Gujarat’s oldest museum at Bhuj, watching Rann of Kutch from the top of Kutch’s tallest mountain: Kalo Dungar, Foxes being offered food by saints, visit to Mandvi’s traditional ship making industry, Mandvi beach, visit to palaces… Ah, these can the best annual bash this year-end. These and many more are the celebrations lined up for the Rann Utsav 2010. Also called the Kutch Utsav, the tourism authorities of Gujarat organize events in Kutch to showcase the rich culture of this district, one of the largest in India. It is a three to four days of cultural extravaganza organized at different locations within Kutch. The fair is like a mirror to the traditional art forms and culture of Gujarat. There is a perfect blend of enthusiasm, creativity and spirit of celebration that glorifies the magnanimous aura of Rann Utsav. Celebrating Rann Utsav year after year and adhering to the high standards that it has set for itself is no mean feat, but the people of Kutch have managed to do it admirably for years together and the present year is not going to be an exception either. The 2010 version of the Rann Utsav will be the longest till date, with the event slated to last one whole month this time. The celebration is being organized by the State Government and the Tourism Corporation of Gujarat Ltd. The Rann Utsav will be held from December 19, 2010 to January 18, 2011 while the main event will be organized between December 19 and 22. The village of Dhordo, where the permanent tents are set up, is expected to see an influx of tourists during the Rann Utsav 2010 which is expected to be an elaborate affair. Kutch is a unique manifestation of nature’s blessings along with the talents gifted to the people. Also, the people of Kutch are known for their hospitality and warmth of conduct. And the spirit of these Kutchi people comes alive in this festive environment of the Kutch Rann Utsav. The people of Kutch are defined through the creative ingenuity of the artisans and craftspeople, assorted array of folk music and performances, mixed representation of culture and communities and a vast diversity in ecology. Apart from the local residents, the festival is visited and enjoyed by more than 8000 tourists from all over the world. This is the only time when natives of the region and travelers along with Government administrative officers come together to celebrate the mystical magic of Kutch and its diversity. The celebratory festival begins in the Bhuj city and goes around the district with a grand finale again being held at the preliminary destination. It is an unparalleled showcase of the ethnic, widely different yet hugely diffused spectrum of Gujarat’s traditional art forms. The grasslands of Banni, a semi arid area also showcases the wide range of arts and crafts of the region, a feat that the people are justifiably proud of. The most enchanting experience in the festival is the presentation of different art forms, dances and music during the shade of Full Moon and in an aura of chilling winters. The spirit of the Kutch region is depicted with style at the festival with the aid of dances, music and pageantry which is colorful to say the least. Generally coinciding with Shivratri, colorful fairs are also held near the beach or the banks of a lake. New Year celebrations will also be a high point of the Rann Utsav, 2010 with water sporting events being organized at the Mandvi Beach and a photograph gallery being set up at Kutch. Ten food stalls will also be engaged in serving authentic Kutchi delicacies which will undoubtedly make celebrating Rann Utsav a memorable event compelling the visitors to come back for more every year. Other attractions are palaces, museum and royal cenotaphs of Bhuj, the beaches and palaces of Mandvi, the holy lake of Narayan Sarovar, the craft villages of Banni, bird rich marshes, rural lifestyles and beautiful handicrafts, it is a potential paradise for the tourist. Plenty of colorful dancing, music concerts, ‘Sindhi bhajan’ performances, ‘Langa’ desert music, folk arts and craft demonstrations, ballads and other ethnic shows are some of the many highlights of this festival. Stalls sell embroideries, jewellery, woodcarvings and other regional handicrafts. Rann Utsav is an ideal occasion to be part of the region and experience the zeal and uniqueness of the people through a celebration of life! It is an ultimate combination of fair-trade, relationship and sharing of life & ideas among people from different places. Kutch has got some of the unseen places to visit which you may cherish all your life! If you have missed it until now, don’t regret, start packing your bags. The D-days are at a stone’s throw.